The Explorer wing has set the standard in simple, effective twin-cylinder wing design over the last 8 years or so. There are many original Explorers wings still in use, with hundreds of exploration dives behind them. It is a very simple horseshoe shaped bladder, with a high density nylon outer layer, and a super tough inner bladder. 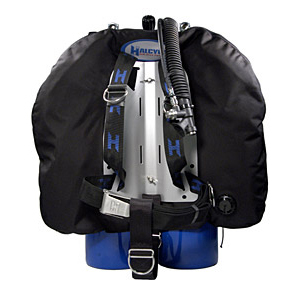 This comes in two buoyancy configurations, the 40lb and the 55lb. For UK diving with twin 12l steel cylinders and one or two 7l decompression cylinders, this is ideal as long as you are correctly weighted. The 55lb is often too big in this set-up leads to drag problems and causes the rear dump valve to wrap too far around the cylinders for easy access. If youâ€™re using larger diameter cylinders such as 15â€™s or 18â€™s, then the 55 becomes a more useable wing and copes with the extra weight well. Itâ€™s always worth checking that any wing that you choose will support you on the surface with all of your equipment. Wreck and Cave offer our try out service for all customers, so you can be assured that your equipment choice is the right one. Just get in contact, and weâ€™ll arrange a day at an inland site and you can try out the various configurations of wings, backplates etc.